5) Understand the effect of trauma on the family unit and interpersonal relationships. Trauma is our emotional response to a disturbing or distressing event. The impetus for the conference focus came through expert opinion and strong recommendations. “As we have talked with supervisors of student internships and members of the Social Work Advisory Council, among others, the issue of trauma came up as number one over and over again,” Limb says. Limb says that most mental health agencies in which students work in are dealing with trauma-related issues. All students participating in the graduate program are required to participate in two internships. This year, in addition to the usual format of plenary speakers and break-out sessions, the conference also offers a self-care element. “Given that the nature of trauma is a very sensitive topic, participants have the option of entertainment or self-care during lunch,” Limb explains. 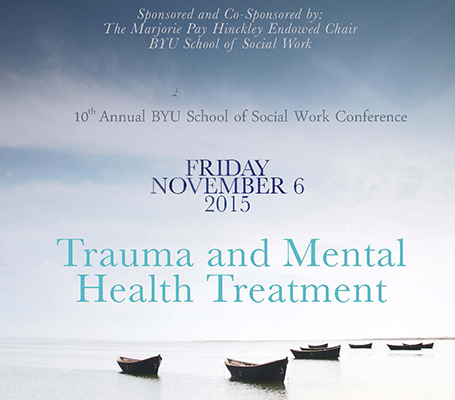 Conference organizers say the purpose “is to not only shed light on this topic, but to provide an understanding of how to care for, and meet the needs of those who deal with trauma.” Sponsors for the Conference include the School of Social Work, The Marjorie Pay Hinckley Endowed Chair ​in Social Work and the Social Sciences and the BYU College of Family, Home, and Social Sciences. The event is free to the public. Visit swevents.byu.edu to get more information or to register. Guests may register at the Varsity Theater in the Wilkinson Center the morning of, if capacity has not yet been reached.